OCTOBER 2017 THE SHOP 29 FLOWMASTER'S DELTA FORCE INTAKES FEATURE ULTRA-TRICK LOOKING DURABLE INTAKE TUBES AND LARGE HIGH FLOW CONICAL SHAPED RED AIR FILTERS. OTHER FEATURES INCLUDE INCLUDE A CUSTOM DESIGNED BLACK POWDER COATED AIR DAM, HIGH QUALITY REINFORCED SILICONE COUPLERS, ALL STAINLESS STEEL HARDWARE AND A LIFETIME LIMITED WARRANTY PROTECTING YOUR INVESTMENT. FLOWMASTER'S DELTA-BOOST POWER TUNERS ARE ENGINEERED TO GIVE YOUR CAR OR TRUCK THE EXTRA POWER NEEDED FOR PASSING, TOWING OR CUTTING LAPS AT THE TRACK, AND INSTALLS EASILY AND QUICKLY, GENERALLY IN LESS THAN A MINUTE. MAXIMUM PERFORMANCE AND EFFICIENCY IS ACHIEVED WHEN PAIRED WITH FLOWMASTER EXHAUST SYSTEMS. WWW.FLOWMASTERMUFFLERS.COM VISIT US AT SEMA! CENTAL HALL BOOTH #22351 // SOUTH HALL BOOTH #30265 707.544.4761 PAIRING AN ICONIC FLOWMASTER EXHAUST SYSTEM WITH OUR NEW DELTA BOOST MODULE AND DELTA FORCE INTAKE WILL TAKE YOUR TRUCK OR CAR TO THE NEXT LEVEL. DEPENDING ON YOUR CHOICE OF SOUND, WE HAVE 5 SERIES OF EXHAUST SYSTEMS / KITS DESIGNED FOR DIFFERENT VEHICLE APPLICATIONS THAT PRODUCE THAT DISTINCT FLOWMASTER SOUND IN MILD, MODERATE, AGGRESSIVE, AND VERY AGGRESSIVE TONES, AND WIDELY AVAILABLE IN ALUMINIZED OR STAINLESS STEEL CONSTRUCTION. loop AFR feedback control; individual cylinder fuel and ignition trim; map switching; data-logging of 100 channels up to 1,000Hz/channel; and lots of inte- grated engine protection strategies. The outside factor having the greatest effect on the Tuner/Programmer market is … … that with engines being more pow- erful and efficient from the manufacturer, and with so many talented engine builders having the technology to create ultra-high- performance versions of these engines that are capable of outrageous amounts of torque and power, the need to be able to control them has never been more critical. The advantage to a standalone system like the Infinity ECU is that it combines not only the tuning elements—controlling fuel and spark—but all of the ancillary controls needed to make the power work for you, versus buying several independent control systems and integrating them. If you look at the big picture, there is typically a cost advantage to this as well. 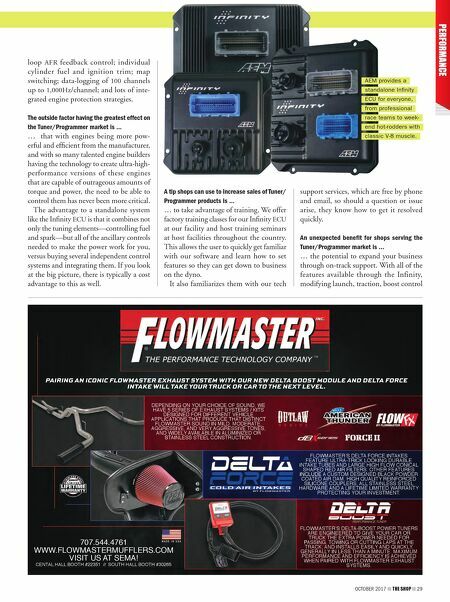 A tip shops can use to increase sales of Tuner/ Programmer products is … … to take advantage of training. We offer factory training classes for our Infinity ECU at our facility and host training seminars at host facilities throughout the country. This allows the user to quickly get familiar with our software and learn how to set features so they can get down to business on the dyno. It also familiarizes them with our tech support services, which are free by phone and email, so should a question or issue arise, they know how to get it resolved quickly. 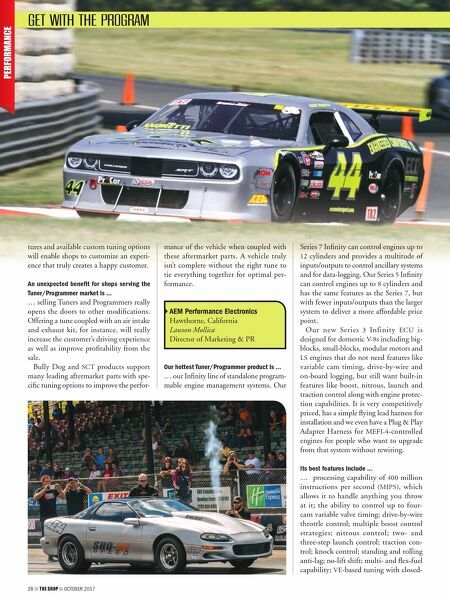 An unexpected benefit for shops serving the Tuner/Programmer market is … … the potential to expand your business through on-track support. With all of the features available through the Infinity, modifying launch, traction, boost control PERFORMANCE AEM provides a standalone Infinity ECU for everyone, from professional race teams to week- end hot-rodders with classic V-8 muscle.